If you think local programming ends at 7p, you better ask somebody. Patrick Creighton (Late Hits) is the Night's Watch from Game of Thrones. Patrick is embracing his new assignment and make no bones about it. 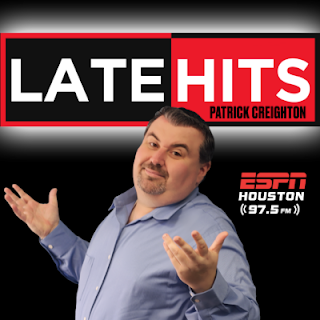 Currently, neither Sports Radio 610 or Sports Talk 790 have consistent live local programming. As a listener, I am not conditioned to listen to re-aired shows. On the radio, it has to be Live and consistent, I'm a creature by habit. I can only listen to re-aired shows if it's a podcast. Patrick understands the unique position he's in and brands his show as the only consistent live show during his time slot. Outside of Patrick being the only consistent night show, the show is decent. I like it. He plays the hits but will go with whatever topic you bring if he's interested. At a time when the baseball is relevant in Houston again, he's like a damn encyclopedia for all of those delicious MLB acronyms. In other words, the dude can talk some baseball. I believe its because he's originally from a pure baseball town (NYC) where baseball is damn near if not bigger than football.